What’s your first experience with comics? How did you get into them? What was the first comic you really fell in love with? My folks used to buy me nursery comics before I went to school, before I could read. I can't remember the first one. Every Xmas, my dad bought me the Rupert the Bear annual. I still love the work of Alfred Bestall, and I reference Rupert in Grandville. Your work is really multifarious in nature. Sum up your trademark style in one sentence! Adaptable to different sorts of stories. Your career started off in the London underground comics scene. What was that time like for you? What’s it like going from there to where you are now? It was an exciting time in UK comics and possibilities for adult stories (comics were strictly for kids till the undergrounds) seemed limitless. It was the beginning of the small press, "alternative" comics and 2000AD. And I was totally broke! Comics have come a long way since then, almost achieving mainstream acceptance, and I'm happily making a living writing and drawing. What, for you, has been the most rewarding work you have put out? It has to be The Tale of One Bad Rat, not just because of the script and art, which was my best to that date, but because of the positive feedback I still receive from abuse survivors after all those years. Talk us through the work you did with Batman for DC. What’s your favorite Batman graphic novel? 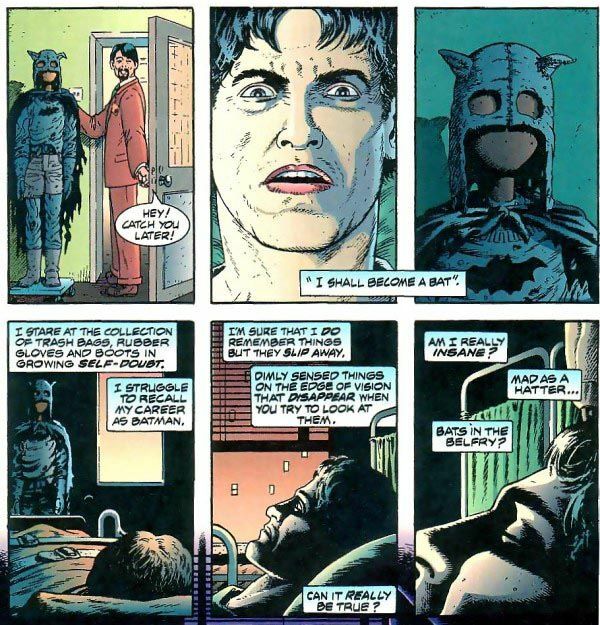 I only wrote and drew a two-parter for Legends of the Dark Knight titled Mask. The Dark Knight Returns is my favourite, though I have to say that I've not read many at all. I hardly ever read superhero stories. What, do you think, makes a good graphic novel? Apart from the obvious, what can you do with a graphic novel that you can’t do with an ordinary novel? The narrative (whether verbal or "silent") should be involving and interesting - or exciting, if an adventure story. If words are used they shouldn't simply repeat what the illustrations show but add to them. The storytelling should be clear, unless the intention is to confuse. The main thing is that it shouldn't be dull. What sets graphic novels apart from prose books is that they are more than the sum of their parts. The resulting experience is unique and impossible to convey. To illustrate what I mean, consider that a novel consisting purely of text could be memorised and repeated out loud, written or typed out verbatim, exactly as it appears in print. Try reproducing the experience of reading a comic like that! Talk to us about your great Grandville series. What was your inspiration? How did you come up with it? It was inspired by the illustrations of the mid-nineteenth century artist Jean Ignace Isadore Gerard, who produced many anthropomorphic pictures under the nom de plume "JJ Grandville". I imagined that Grandville could be the nickname for Paris in an alternative reality populated by anthropomorphic characters. The rest grew from there. You've just released the third Grandville book. Without giving too much away, what can we expect to see in the fourth? Grandville Noel is, as you can guess, set at Xmas, and is a missing persons case that leads Detective Inspector LeBrock into conflict with an evil religious cult. For Dotter of Her Father’s Eyes, you worked with your wife, Mary. How did you take to working together? What was the process like? Will you be collaborating in the future? It was very easy and very natural working together and the closest writing/drawing collaboration you can imagine. I'm currently doing the lettering, layouts and panel compositions, the visual storytelling if you will, for Mary's next graphic novel, Sally Heathcote. The book is being drawn by the brilliant Kate Charlesworth. Apart from the last Grandville, what else have you got in the pipeline? I'm currently scripting the fifth Grandville before starting to draw the fourth and scripting a graphic novel web comic, artist to be announced soon! Check out Bryan's website, and find out more about Comica's exciting events this November here.